All Souls’ Day falls on November 2nd. 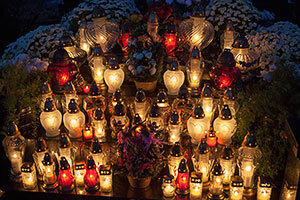 The official Czech name is Památka zesnulých ("a remembrance of those who have passed"), but everyone calls the day dušičky ("little souls") or všech svatých ("of all saints"). People sometimes compare this old tradition to Halloween, but the two don’t have much in common. Dušičky is a quiet time in the Czech Republic. 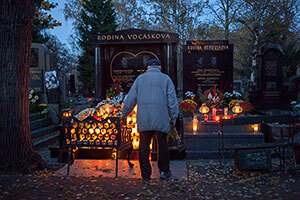 People visit the graves of family members and relatives to light candles, lay flowers and wreaths and spend a few moments. 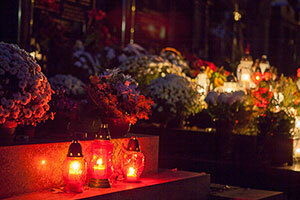 If All Souls’ Day falls on a work day, trips to the cemetery are often taken during the preceding or following weekend. 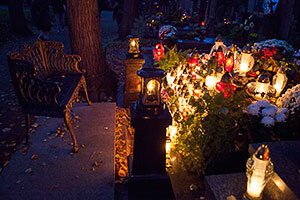 The flickering glow of hundreds of freshly lit candles makes the atmosphere at cemeteries during dušičky time quite beautiful. The weather is usually chilly or rainy, but it doesn’t prevent Czechs from observing the tradition.